Those who own large buildings know rekeying a building can be a substantial expense. Fortunately, InstaKey offers a solution to this issue and provides effective security to any property. If a building has a total of 500 doors, owners will need locks, keys and likely Master keys, for all of them. 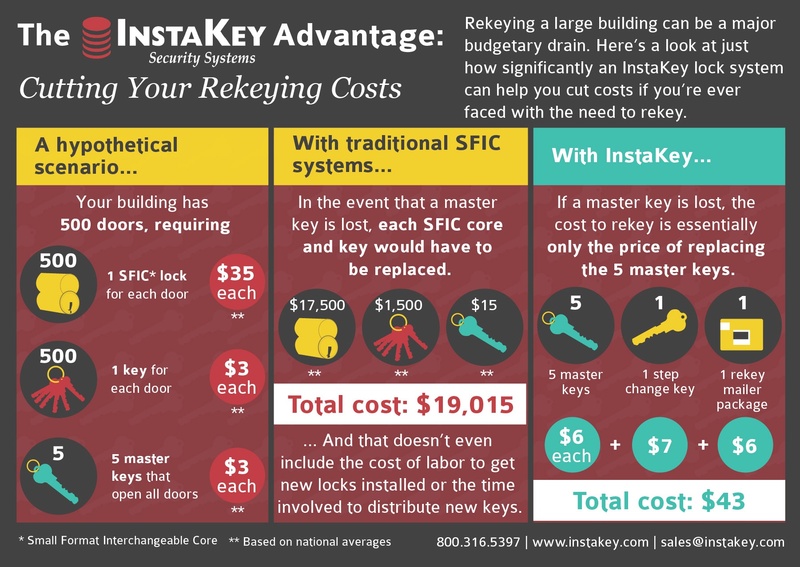 Based on national averages, a traditional small format interchangeable core system typically costs $35 for every lock, $3 for each key and $3 for each Master key. Assuming all 500 doors have a lock, a key for each door and a total of 5 Master keys that access all doors, the total cost of ensuring security of the building if a Master key goes missing can get expensive quickly. Locks will cost around $17,500, 500 keys would cost about $15,000 and the Master keys would be around $15. These expenses could total up to $19,015! Unfortunately, this does not even include the cost of labor, and if an owner is forced to rekey again, these expenses can become even more substantial. With a key control system from InstaKey, if a Master key is lost or stolen, building owners will only need to pay a small fraction of the aforementioned expense. Owners only need to purchase 5 replacement Master keys at $6 each, one step change key to reset the locks at $7 and one rekey mailer package at $6. These products bring the total cost to only $43 – potentially saving the owner $18,972! With a key control system, owners can quickly and conveniently change locks, restore security to their building and redistribute new keys to those who require access to specific areas. Implementing this system will save building owners a substantial amount of money without compromising security because they can also quickly change locks without having to wait around for a locksmith.